Don’t let fallacies about cruising to deter you from enjoying a once-in-a-lifetime holidays at sea. Here are eight of most common misconceptions about cruises and why, in reality, they shouldn’t stop you experiencing the cruise lifestyle for yourself. If you’re prone to claustrophobia and worried that you’ll feel trapped on a cruise getaway, simply opt for a bigger cruise ship when you come to book. Some of the larger cruise ships are like floating cities, covering a huge area and boasting plenty of wide open spaces on-board – perfect for anyone who hates to feel too enclosed. Royal Caribbean’s Oasis Class ships – Harmony of the Seas, Oasis of the Seas and Allure of the Seas – are the world’s biggest cruise ships, and with features including a 5-deck high Central Park and outdoor Boardwalk areas, thoughts of claustrophobia will be far from your mind on-board. There are plenty of other colossal and feature-packed cruise ships to consider, including Royal Caribbean’s new Quantum Class vessels, Princess Cruises’ Regal Princess and P&O Cruises’ magnificent Britannia. While cruise holidays are often seen as an extravagant and expensive way to holiday, there are plenty of ways to bag a bargain when you come to find your next voyage. Off-season cruises to the Caribbean, Mediterranean and North America will often have greatly-reduced fares, offering the chance to see the world for less. The extras on-board that can also become expensive. However, if you secure an all-inclusive deal, perhaps with an on-board spend incentive; and take a rain-check on that indulgent (but expensive) spa treatment) all of your on-board costs can be covered, so you needn’t worry about a nasty surprise in your end-of-cruise bill. On-board the larger cruise ships, you are unlikely to feel the rocking motion of the waves, as not only are they fitted with stabiliser designed to provide a smoother ride, but due to their sheer size, once on-board, you’ll soon forget you’re even at sea. If you’re particularly prone to seasickness however, always book a cabin towards the middle of the ship, as the movement on the waves is always more noticeable towards the stern and the bow. Cruise holidays are often thought of as exclusively for the older generation, and while some cruise lines aim their holidays towards more mature travellers, when it comes to lines like Royal Caribbean, Norwegian Cruise Line, MSC Cruises, Princess Cruises and many others – this is simply not true. Aside from the fun-filled kid’s club for younger travellers of all ages, cruise ships are packed full of amazing features for every age-group. From on-board water parks, games arcades and sports activities, to rock-climbing walls, ice-skating rinks, dodgems and even skydiving simulators, there are plenty of ways for kids, teens and adults to have the time of the lives at sea. Food is a particularly important part of the cruising experience, and cruise lines usually feature an incredibly diverse range of dining venues aboard their ship, catering for every taste and preference. Cuisine from every corner of the world can be found aboard a cruise ship, so research your vessel before you set sail to make sure there’s something on-board for you. Whether you’re hoping for sophisticated sit-down meal or a helping of your favourite fast food, even the fussiest of eaters will find something they enjoy. There are seemingly endless possibilities when it comes to choosing your itinerary for your next cruise escape. While it’s true that many cruises will call at some of the world’s most popular tourists destinations – which could be ideal for certain travellers – there are also a wealth of sailings travelling to more remote, lesser-known port, perfect for anyone seeking a new adventure in far-flung destinations. You could cruise to the breathtaking icy shores of Antarctica, the scenic tropical ports of South America and the Galapagos Islands, the tiny islands of the South Pacific alongside a host of other beautiful and secluded destinations, offering the opportunity to truly relax or discover new cultures in an exotic corner of the world. There’s no chance that you’ll get bored whilst at sea when you cruise aboard some of the world’s most innovative, exciting and feature-packed cruise ships. You’re only concern will be fitting everything into your limited time on-board. Make sure to do your research before you book, as some cruise ships offer nothing but rest and relaxation while others will provide countless entertainment options and activities. So which would you prefer? It’s true that many voyages will require flights and transfers to get you to the embarkation port, with incredible sailings departing from destinations across the world, including Miami, New York, Singapore and Barcelona. UK-based cruisers, however, will also find a wealth of itineraries departing from British ports, perfect for a convenient start to their cruise holiday. 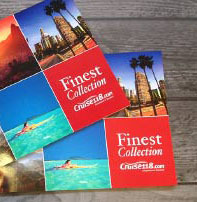 Cruise lines including Royal Caribbean, P&O Cruises, Cruise & Maritime Voyages, Fred.Olsen Cruise Lines, Princess Cruises, Celebrity Cruises and Cunard are operate voyages from the UK, from popular British ports including Southampton, Harwich, London Tilbury, Leith and Rosyth. If you have any questions about cruising, or would like help in choosing the best cruise, why not give our Cruise Concierge team a call? They’ll be more than happy to help, even if you don’t know where to start with booking your cruise. Just give them a call on 0808 1234 118.